MOM is worth it! Especially when there is free shipping! Place an order for $65 or more, and you will get free shipping! Just think of it, a few things for yourself, some treats for your mom, and we’ll pay to get it to you! What a gift! This special begins today and ends May 10th, so order soon please! We will take off the shipping. Soup’s On! Who can’t always eat soup? Spring is coming real soon, but we know we will still have chilly days ahead! This is your chance to stock up on the award winning soups from Maggie and Mary! You’ll find all their delicious flavors on our website, at www.seaquistorchards.com. Do a search on our online store for Maggie and Mary, and the selection of soups will be available to you. We will send you a free box of the #1 winner, Creamy Wild Rice Soup Mix, with every 3 boxes you order! There isn’t a better soup mix out there– so if you haven’t tried them, – this is the perfect opportunity! Eat well and be well, with our delicious soup mixes! This offer is available March 19 through March 31. You will not see this in your cart. We will just add it. Sale – bration! Really? Yes! In conjunction with the Grand Opening of our production facility, you will receive a 10% discount on all Seaquist Canning products purchased Saturday, September 29, 2012 in store or online. Only on Saturday September 29, 2012. Get cozy! Warmup with a free soup mix from Seaquist Orchards Farm Market with purchase of $35 or more. Enter promo code GETCOZY at checkout, and we will include a free Cream of Wild Rice Soup mix. Heather is our next family member we would like you to meet! She is married to Zach, and mother to Collin. Heather has many different responsibilities at the market, – depending on the needs, and on the day. Some days may be spent fixing computer problems, – or any other technological issues. She also works diligently on improving and maintaining our website, works with the online store, our fundraising program, and can be found working all over the market, doing whatever needs to be done. The computer is froze. Call Heather. Need office supplies? Ask Heather. Need help receiving products? Ask Heather. Is the smoothie/slush machine not working correctly? Tell Heather. Need a break? Ask Heather to fill in. Need help making pies? Ask Heather. Need a photo taken? Just ask Heather. Heather has been heard to say that she thinks her job is mainly to help Kristin, and that is exactly what she does! 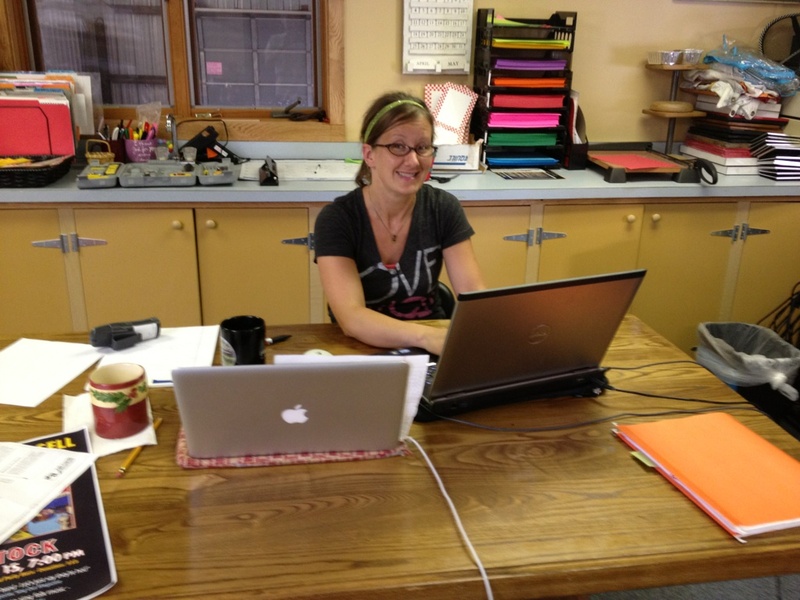 Thank you Heather, – for helping make things run smoothly at Seaquist Orchards Farm Market! It may be warm in Door County! It may be a warm day in Door County, but you can cool off with a delicious Cherry Almond Smoothie, or Apple Cider Slush at Seaquist Orchards Farm Market!